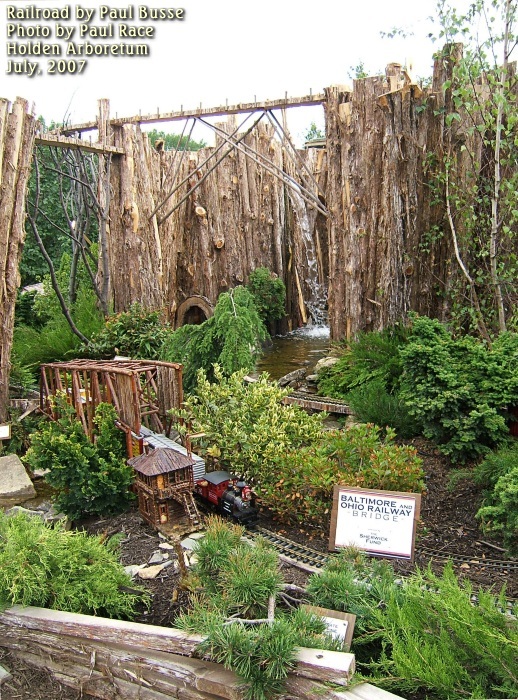 After nearly three years of preparation one of the nation's premiere arboretums is hosting an amazing garden railroad built by one of the nation's premier landscape architects. The Holden Express(tm), built by designer Paul Busse opened on June 17, 2007. It will close on September 23, 2007. 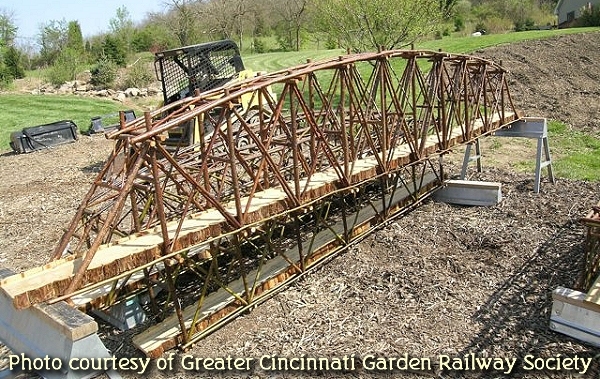 Paul, who lives near Cincinnati, builds professional garden railroads all over the country, including botannical gardens at Chicago, Philadelphia, Atlanta, New Orleans, and New York City. 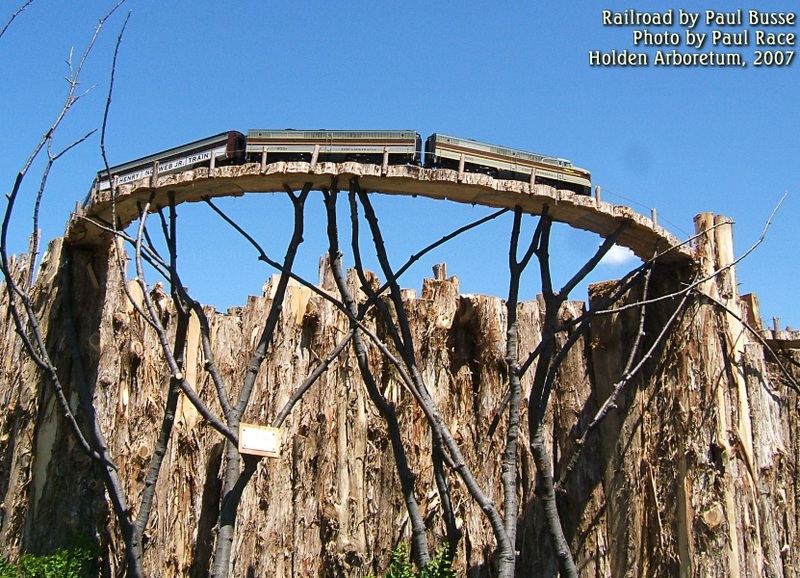 The Holden Express(tm) is installed at the Holden Arboretum, in Kirtland, Ohio. Members of the Race family and several friends from the Northern Ohio Garden Railway Society went to see this railroad on two different days (and Paul has two more days coming up) because Holden Arboretum also invited us to put on a series of demonstrations showing how to set up a garden railroad. To see an article about how the July sessions went, click here. Back to Paul Busse's railroads, the NYC railroad is profiled on Good Morning America almost every year - its return is anxiously awaited as another sign of the holidy season. I say return, but really, it's a whole new railroad - most of last year's special buildings come back, with a few more added, but the plan is entirely new each year - Paul never really builds the same railroad twice. If you live within a half-day's drive of Cleveland, and you've never seen a Paul Busse railroad, try to get to this one. 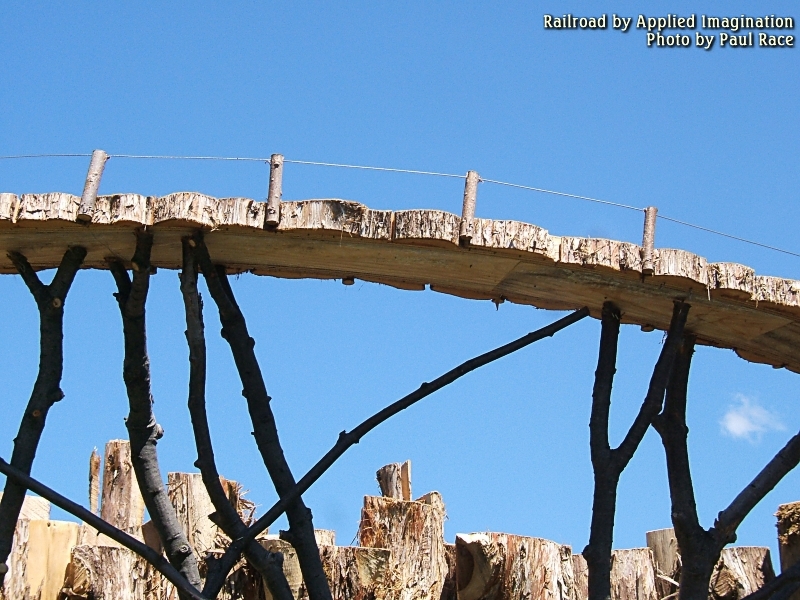 Use of regional natural materials for buildings and bridges. Pine cone "petals" substitute for roofing tile, twigs substitute for siding, larger twigs substitute for beams, and so on. Features that commemorate the region - in the NYC display, there is a Statue of Liberty and a Brooklyn Bridge built entirely out of natural materials. Complex routes that make the railroad much more intriguing to watch than "trains going in circles" - even though they do eventually get back to where they started. Firman barn and dairy house, built in the 1920s. The trees of the arboretum, specifically a huge red oak that, hollow throughout, fell apart on the grounds while the railroad was being planned. 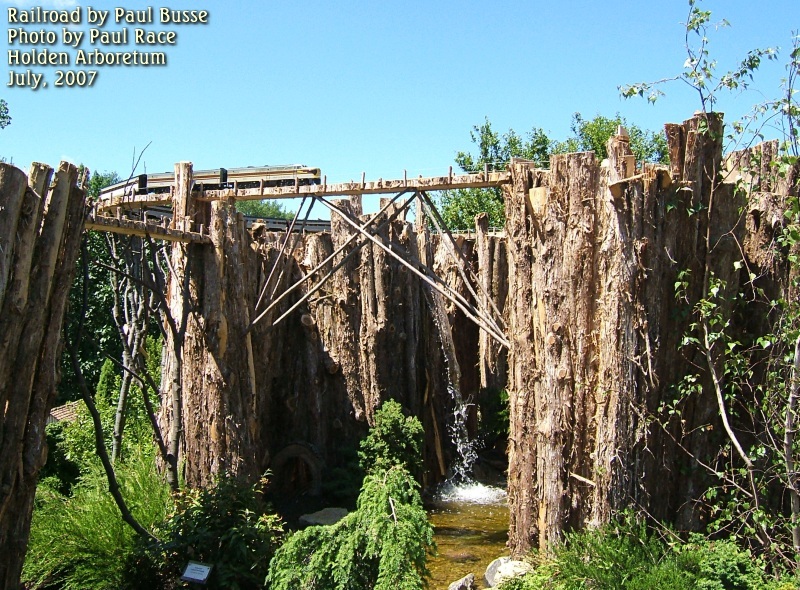 Paul built the "mountains" of the railroad to look like huge tree trunks, covering them with bark (cypress or cedar?). He also incorporated many pieces of the oak itself - some of the tunnel entrances are slices of the hollow branches, and one long branch is arranged something like a "snowshed" along a right-of-way. While we were there, Holden volunteers had a number of other were helping youngsters take "clippings" of many small plants that are often used in garden railroading, including sedums, thymes, and Chamaecyparis Obtusa (a slow-growing false cypress). 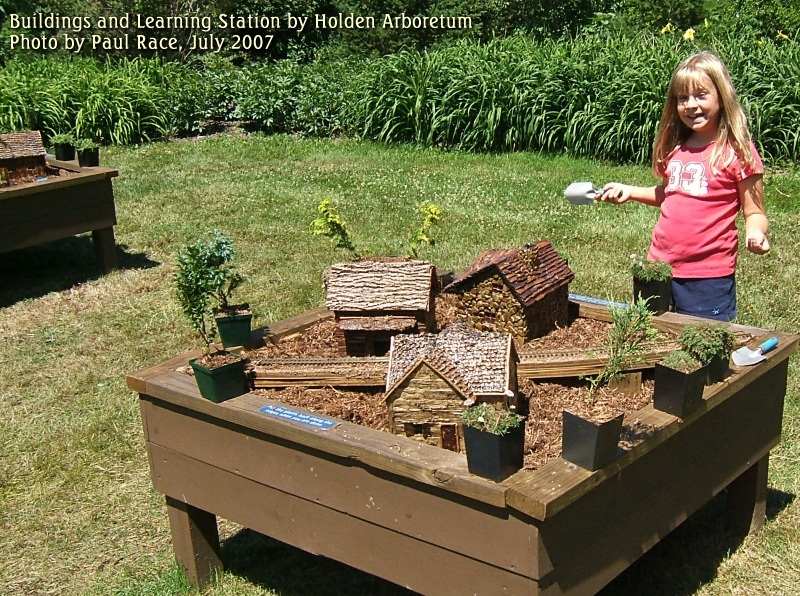 One activity center near the Holden Express included four "boxes" filled with mulch and decorated with structures that Holden's staff built in the style of Paul Busse's structures on the railroad display. 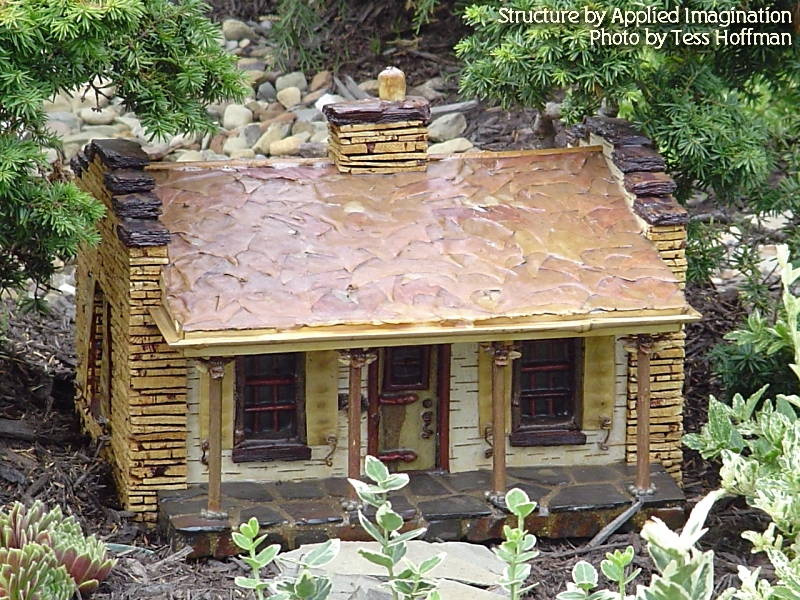 Every day, volunteers would bring out plants that resembled small trees, and youngsters would practice "planting" them in the mulch around the structures. What you can't tell when you look at the Holden Express is that work on it started many months ago. 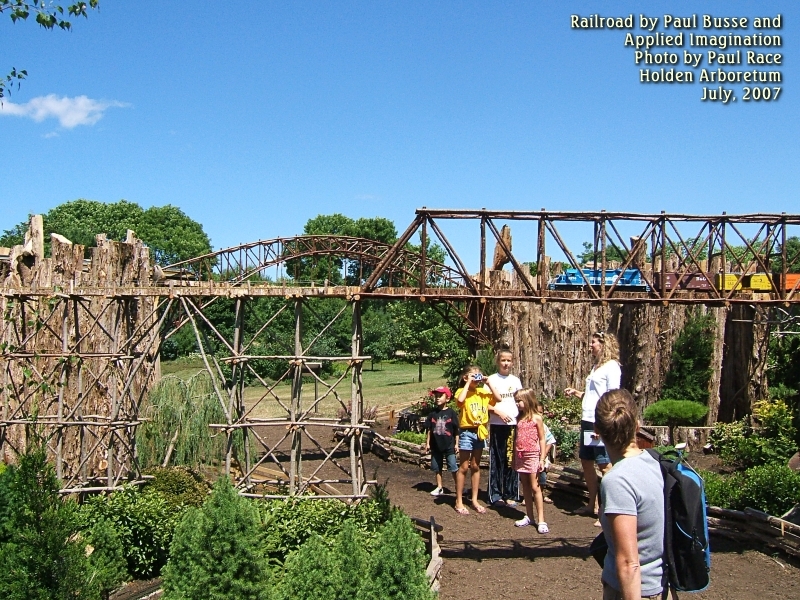 By April, Paul's Company, Applied Imagination, had already built many of the structures and bridges for this railroad. Some of the bridges were too big to store inside, even in Applied Imagination's large warehouse/factory. Paul's team also cut out most of the roadbed before they came. In garden railroading terms, roadbed is whatever supports your ties and track. 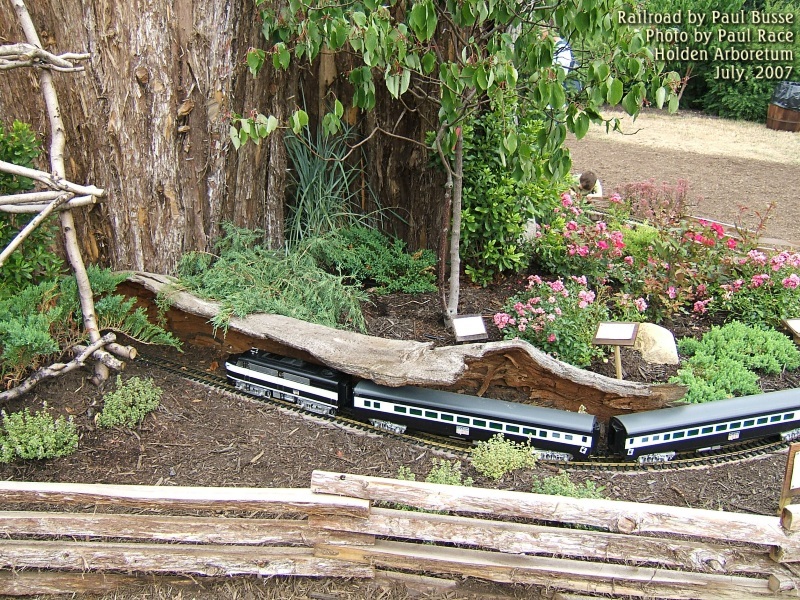 The roadbed Paul used for this railroad is two layers of 1" or 5/4" pressure treated wood. Each piece is cut at angles of 75 degrees or so and butted up against the next piece to make a curve. The joints are staggered for strength. When the roadbed is fastened together, Paul uses a very expensive saw to carve off the "corners" to make what looks from above or below like a single smooth, curved board. Though this railroad is temporary, the construction of the roadbed would hold for decades if necessary. 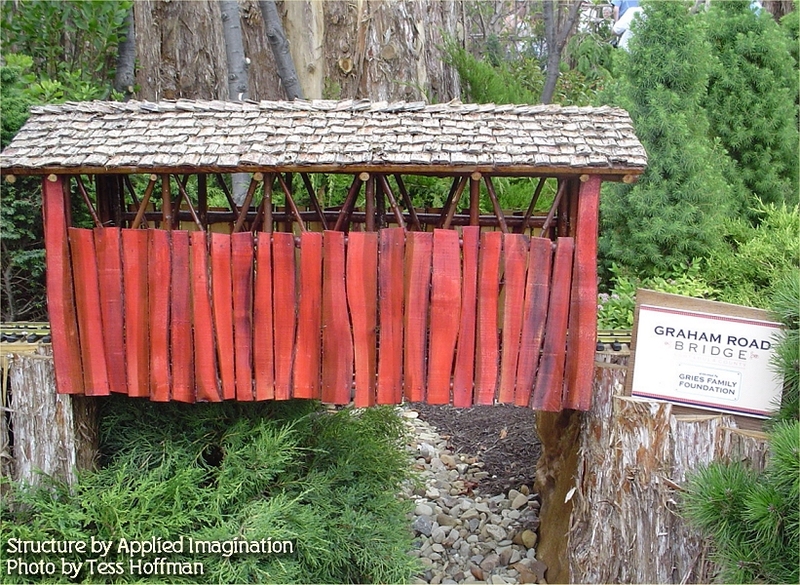 According to one observer, much of bark edging was added onsite, although the edging was applied to the bridges in the workshop. 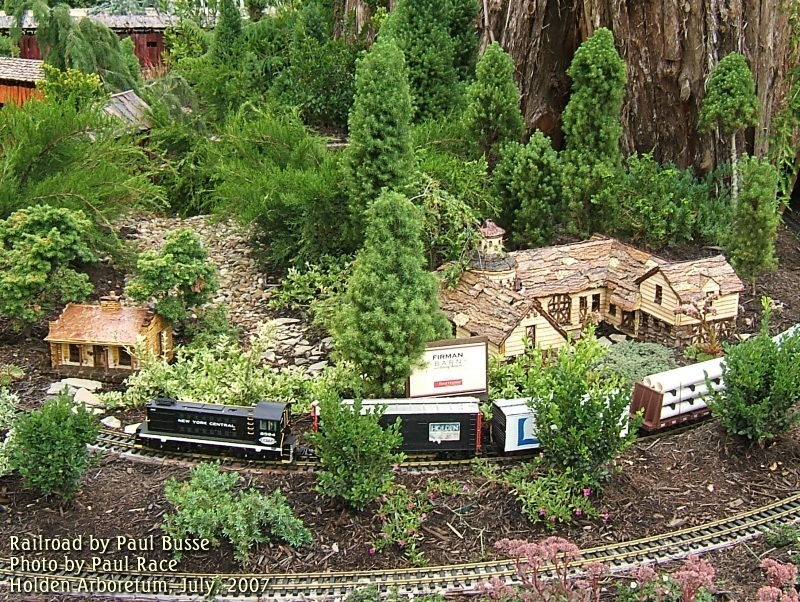 At the same time, one of Paul's road crews was disassembling the New York Botanical Garden's railroad which, like DC's runs during the holiday season. 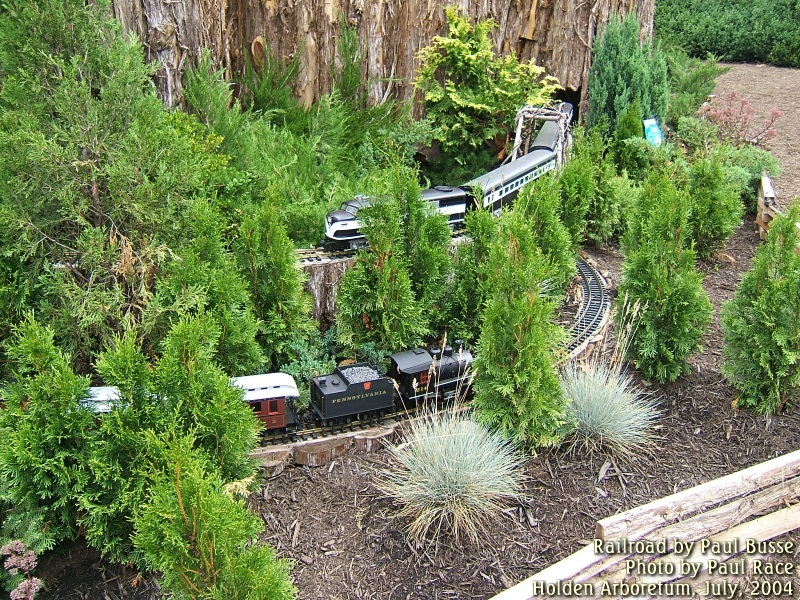 For the Holden Express, they "borrowed" many of the dwarf conifers, thus saving Holden Arboretum some expense, to the administrators' delight. As I mentioned before, Paul likes to design railroads that keep you guessing. In a way, the overall plan is so unusual and asymmetrical that it's difficult to describe. 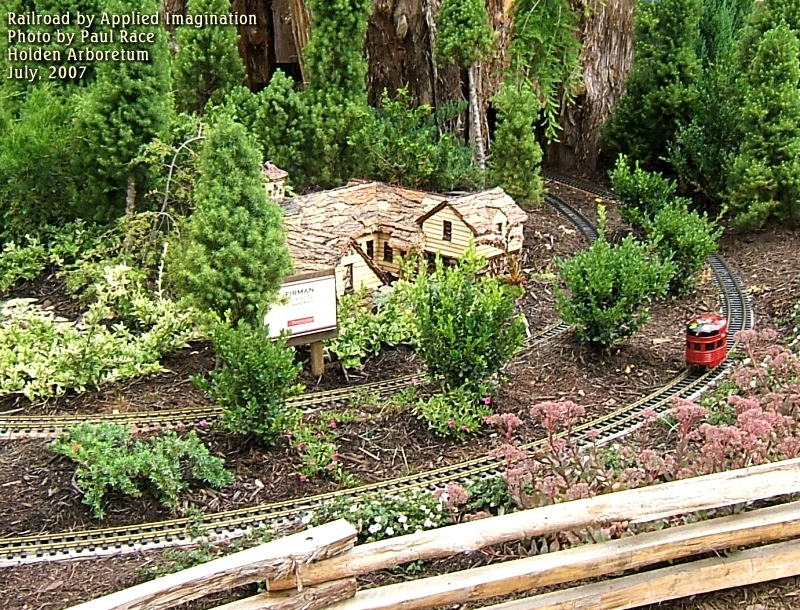 Imagine five "islands" of garden railroading that you can walk among (depending on how you count them you could get between three and seven, I suppose). Each Island has a railroad or two that is apparently circling two or three structures that represent mountains. 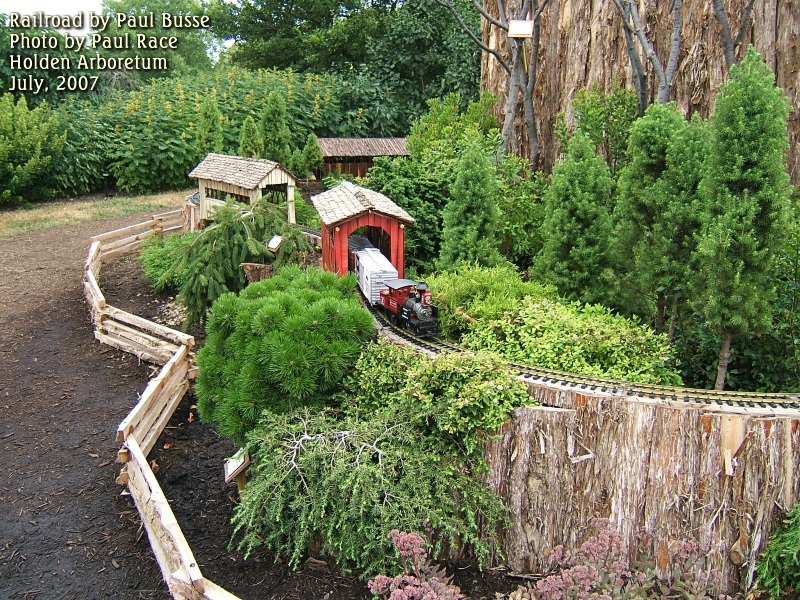 Most of the structures look roughly like redwood or cypress trunks and are several feet across.Part of the secret of the "islands" is that there are extra loops and crossovers inside the huge "tree trunks" so that you're never seeing the whole route the train takes. All of the islands are linked by railroads that run overhead on the magnificent bridges. Two of the islands are also linked by a "back-and-forth" line that goes underneath a small footbridge. They generally have a small trolley-like engine running on that railroad (so the back-and-forth motion makes sense). The first day I was there, though, they were running a USA Trains freight diesel - the other locomotive was getting some maintenance. The second day, I saw that railroad's "ordinary" traffic, an AristoCraft Egglliner, in ladybug colors. 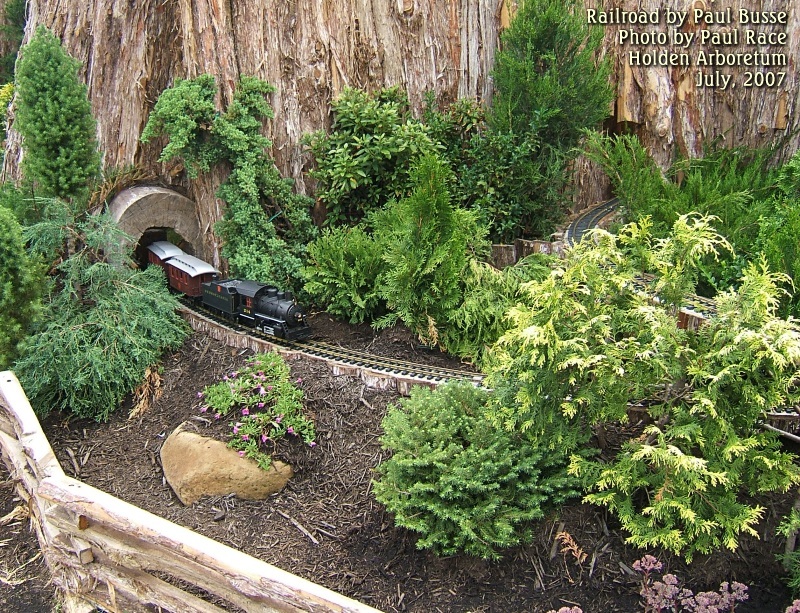 Several of the lower-level railroads go through tunnel openings cut from the hollow branches of the great oak, another way of incorporating the tree theme into the railroad. This leads me to the next point of discussion. I say that the railroads are "apparently" circling the structures, because some of the routes take advantage of those hidden loops and crossovers to come out where you don't expect them, and, just as important, not to come out when and where you expect them. The first day I visited, I was trying to capture a train in every scene I photographed, but kept being "stumped" by trains that took several minutes to come back around a loop that they should have been able to cover in a minute or so. One example is the little train at the right. On the other side of this "mountain" is a matching tunnel portal, also made from a hollow branch. The two portals are about three foot apart. So the train should go into one side and come almost immediately out of the other, right? Wrong. After being fooled a time or two, I realized that that railroad is built like a "folded figure eight" with the inside loop hidden by the structure. The train comes in one end of the "tunnel," veers off to the left, goes around a hidden loop, and then comes out of the other end, a minute or so after you expected to see it. On the other hand, sometimes you're lucky and get two trains in one photo. The two days I was there, these two trains seemed to be destined to meet each other the same place again and again. The second day I was there, there were different locomotives than the first day, but the "meetups" kept happening. Still, on my second visit, I was waiting for a train to cross one more of the really high bridges. Finally a volunteer told me that that loop was out of commission at the moment. Good thing I didn't wait any longer. Trains overhead, trains underfoot, and trains all around. What more could you want? To be honest, some people who run model railroads (including some garden railroaders) wish they could see more "hands-on" operations. On the Holden Express, you won't see anyone switching cars at a siding or timing the train "runs" so that trains can take "turns" using the "mainline," the way real railroads work. 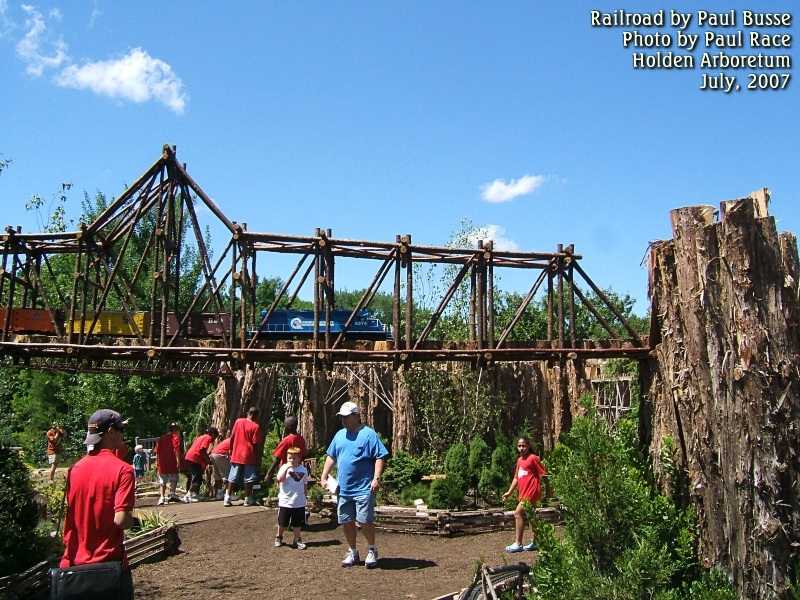 Paul does design those features into railroads he designs for homeowners who want to run trains as well as watch them. But for these large public railroads, Paul works to keep the interest level as high as possible, even for folks who haven't seen a model railroad for decades and ordinarily have very little interest in trains. One thing Paul told me early in my garden railroading experience was to use three dimensions, not two (like "tabletop" model railroads do). That way there would be vertical interest as well as horizontal. Of course the way Paul designs the routes on a railroad like the Holden Express, there are four dimensions of interest (if time is a dimension). He designs things to keep you watching (and, frankly, guessing) for some time. Of course, no representation of the greater Cleveland area is complete without a river. 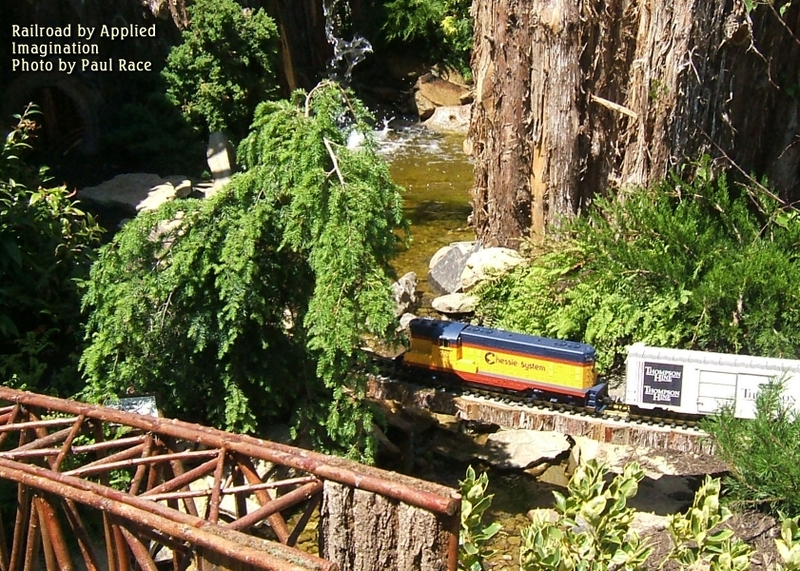 The Holden Express's river starts with a waterfall that is several feet high and provides a soothing splashing sound wherever you are in the "maze." The water then flows gently toward the path, crossed by two bridges along the way. Just before the river reaches the pathway, it goes under the B&O railroad bridge, an asymmetrical "through girder bridge" model, that, except for being made out of natural materials, represents the original pretty well. I also saw a USA Trains freight diesel crossing this bridge, but, what the heck, I'm a sucker for steam, so this is the photo you get. When I first published this article, there were only about six weeks until the Holden Express closed down. If the economy ever recovers, it might be possible to bring the Holden Express back in the future. However, even if this happens, it will not be exactly the same railroad - Paul never builds the same railroad twice. 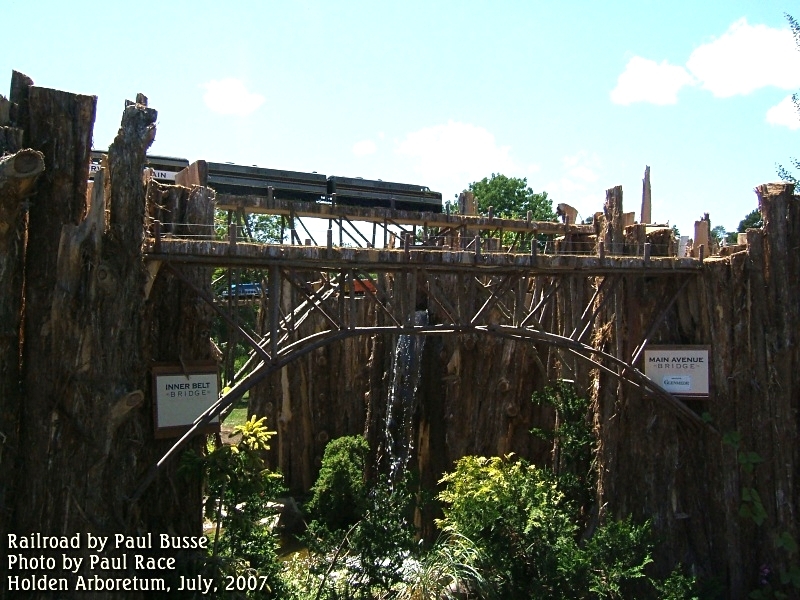 This is a not-so-subtle hint that if you have the opportunity to see a Paul Busse "temporary" railroad, go see it. Many of Paul's railroads come back every year, but a few don't. In addition, Holden Arboretum has many nice features and is well worth a visit or a family membership, even if they don't have trains running. Sadly, the Holden Express has been dismantled for now, but it may return . . . .